Abstract. Particulate matter (PM), of which a significant fraction is comprised of secondary organic aerosols (SOA), has received considerable attention due to its health implications. In this study, the water-soluble oxidative potential (OPWS) of SOA generated from the photooxidation of biogenic and anthropogenic hydrocarbon precursors (isoprene, α-pinene, β-caryophyllene, pentadecane, m-xylene, and naphthalene) under different reaction conditions ( RO2+HO2 vs. RO2+NO dominant, dry vs. humid) was characterized using dithiothreitol (DTT) consumption. 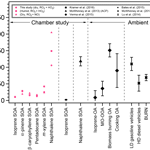 The measured intrinsic OPWS-DTT values ranged from 9 to 205pmolmin−1µg−1 and were highly dependent on the specific hydrocarbon precursor, with naphthalene and isoprene SOA generating the highest and lowest OPWS-DTT values, respectively. Humidity and RO2 fate affected OPWS-DTT in a hydrocarbon-specific manner, with naphthalene SOA exhibiting the most pronounced effects, likely due to the formation of nitroaromatics. Together, these results suggest that precursor identity may be more influential than reaction condition in determining SOA oxidative potential, demonstrating the importance of sources, such as incomplete combustion, to aerosol toxicity. In the context of other PM sources, all SOA systems, with the exception of naphthalene SOA, were less DTT active than ambient sources related to incomplete combustion, including diesel and gasoline combustion as well as biomass burning. Finally, naphthalene SOA was as DTT active as biomass burning aerosol, which was found to be the most DTT-active OA source in a previous ambient study. These results highlight a need to consider SOA contributions (particularly from anthropogenic hydrocarbons) to health effects in the context of hydrocarbon emissions, SOA yields, and other PM sources. How to cite: Tuet, W. Y., Chen, Y., Xu, L., Fok, S., Gao, D., Weber, R. J., and Ng, N. L.: Chemical oxidative potential of secondary organic aerosol (SOA) generated from the photooxidation of biogenic and anthropogenic volatile organic compounds, Atmos. Chem. Phys., 17, 839-853, https://doi.org/10.5194/acp-17-839-2017, 2017. Secondary organic aerosols (SOA) comprise a significant fraction of particulate matter (PM) and may have health implications. The water-soluble oxidative potentials of various SOA systems were determined using dithiothreitol consumption. 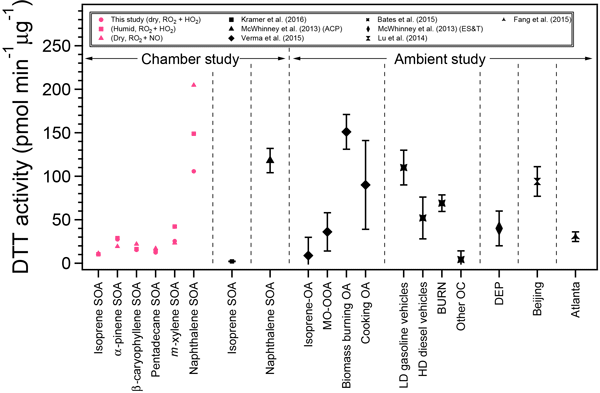 Results from this study demonstrate that precursor identity was more influential than reaction condition in determining SOA oxidative potential and highlight a need to consider SOA contributions from anthropogenic hydrocarbons to PM-induced health effects.